Are you a lover of all things Girl Scout Cookie? I know I sure am! And with Girl Scout cookie season upon us, now is the time to stock up the freezer with your favorites. I’m definitely guilty of eating right out of the package, but this Triple Chocolate Thin Mint Brownie Pie is to die for! 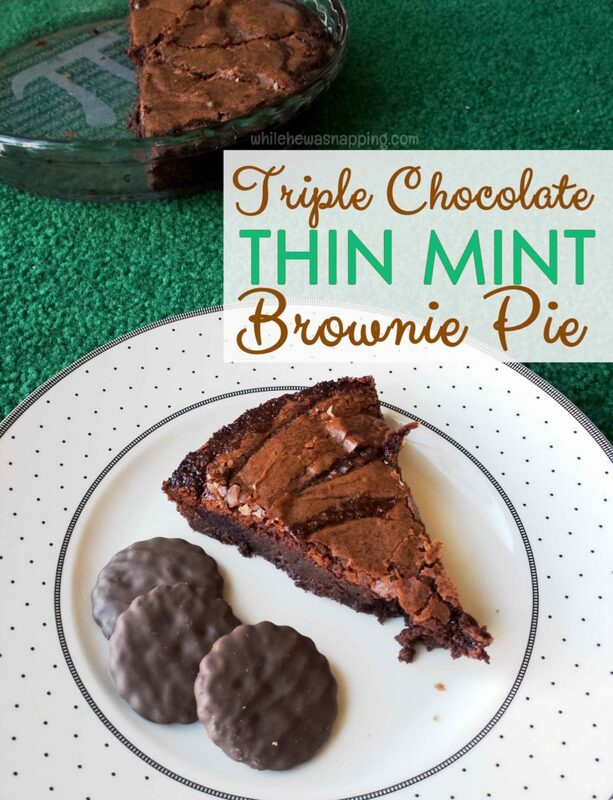 So, get your order in and save a box of Thin Mints for this delectable dessert. Your local little pig-tailed Girl Scouts will thank you. And so will your taste buds! Seize the brownie pie, my friend! TRIPLE CHOCOLATE THIN MINT BROWNIE PIE WHEN IT’S NOT GIRL SCOUT COOKIE SEASON? I love supporting our local girl scout troops, but I’m the first to admit that $5 a box is a bit steep for my budget. I stock up what I can, but when our freezer stash is out, we head to Wal-Mart when we’re jonesing for some Thin Mint cookies. The Great Value Fudge Mint cookies are a sufficient substitute. 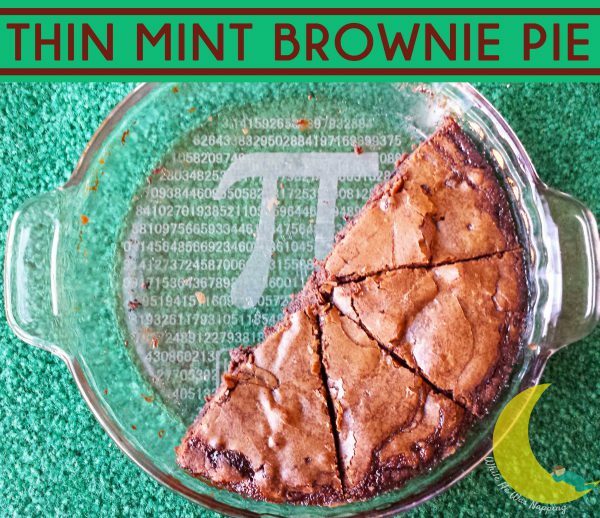 And at less than half the price, it’s okay to use nearly a whole package in a Thin Mint Brownie Pie and not feel guilty. At least about the cost. The calories might be a different story. But, sometimes you just got have a little bit of heaven. Because this pie is a little bit of heaven. The best pie deserves an amazing pie plate, right? One that cooks evenly, makes your dessert look fantastic and if you get the coolest mathematical surprise when you start to serve that piece of heaven, all the better right? This awesome Pi Plate is my go to for all pies – the dinner and dessert variety. You can check these out on Etsy or even order your own custom design. Perfect for holidays, special occasions and gifts too! My favorite thing about this pie is how insanely easy it is to put together a decadent dessert that people will think you slaved over! In less than an hour, you will have dessert ready to wow your dinner guests without spending your afternoon rolling doughs, mixing batters and waiting on bake times. Put Triple Chocolate Thin Mont Brownie Pie on your dessert plan today! 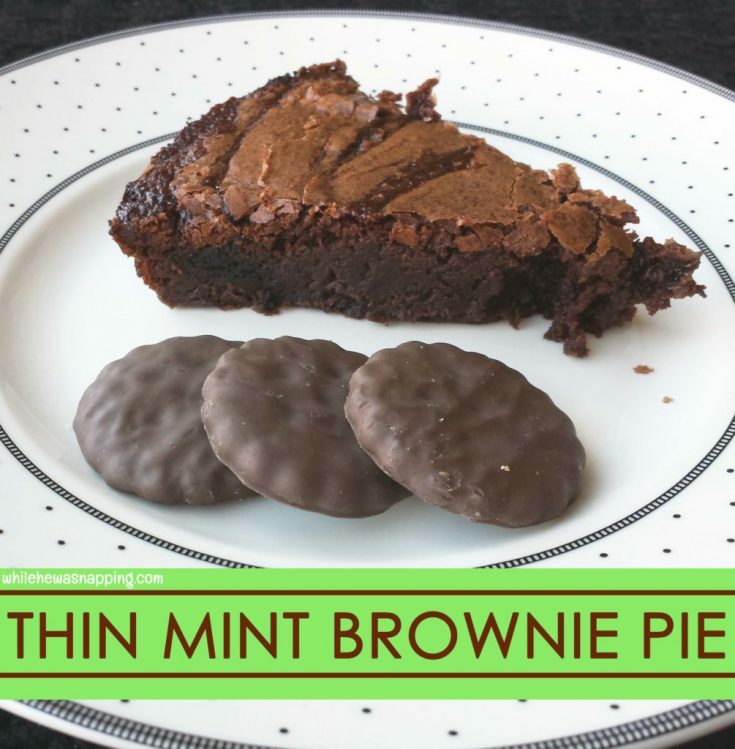 Take your thin mint cookie obsession and kick it into overload with this amazing triple chocolate thin mint brownie pie that takes less than an hour to whip up! Ingredients required for your brownie mix, typically includes: 1 egg, 1/4 cup water and 1/2 cup oil. I use 1/4 cup oil and 1/4 cup applesauce to make them a little less oily and unhealthy. But these are triple chocolate brownies... you might not be too concerned about the calories. Preheat the oven as directed on the back of the brownie mix box. Mix up the brownies as per the instructions on the back of the box. Substitiute half the oil with applesauce for a less oily brownie. Pour half the batter into the bottom of a lightly-greased 8-inch pie plate. Put down a layer of mint cookies. Pour the chocolate syrup on top of the cookies and spread with a spatula to evenly cover the cookies. Pour the rest of the batter on top of the syrup and gently shake the pan to level out the batter. Bake as directed on the brownie box or until a toothpick inserted into the pie comes out clean. Cool, slice and serve with a scoop of ice cream or frozen yogurt. Looking for a dinner pie that will rock your dinner table? Check out this Chicken Pot Pie with crust so flaky and delicious, leftovers will be no problem. Or, for a busy week night, check out this Chicken Pot Pie Casserole option – ready in 30 minutes!